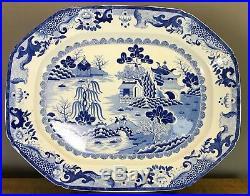 A good mid 19th century ironstone blue and white meat plate in a variation of the'Willow Pattern. 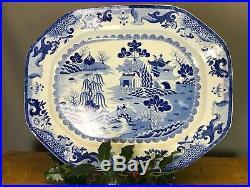 With combed back and printed'Ironstone China' mark. 53cm wide x 43 cm high. In excellent condition, with no damage, repairs or staining. 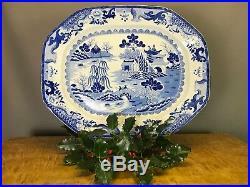 The item "Early Victorian Ironstone Blue & White Meat / Turkey Plate" is in sale since Friday, February 1, 2019. This item is in the category "Pottery, Porcelain & Glass\Date-Lined Ceramics\c. 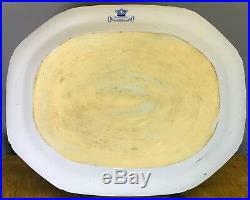 The seller is "luluminx" and is located in Chippenham, Wiltshire. This item can be shipped to United Kingdom.